Hole #8 is a odd little hole. From the tee, you face a 18 ft hill in front of you. The Pole hole is located on the other side of the hill and about 30 feet below the crest of the hill. 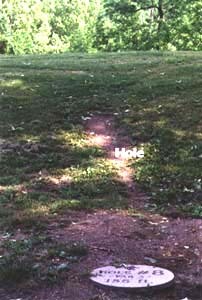 A large tree lies between the tee and the Pole Hole, with a ditch with dense brush below the tree. A swampy area runs out of the ditch and about 15 feet left of the Pole Hole. A good right to left will take you around the tree, but with the angle you need to throw to clear the hill, your disc will often catch the large limbs that protect the right side. 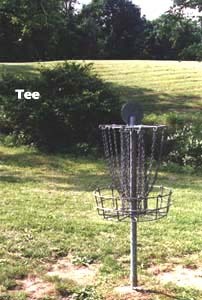 If you thread the needle, the area of the Pole Hole is open and usually gives you a good second and a chance for a birdie.